Anyone that operates an ATV knows like your car, it needs a few things to power up and run. 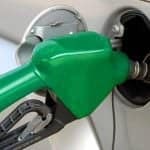 While gasoline might be the first thing that springs to mind, due to the more frequent need to provide it, there are several other items. One that sometimes is forgotten until it doesn’t work is the battery. 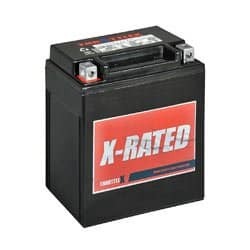 Instead of waiting until your ATV or UTV’s battery dies and heading out to find one that will merely fit, why not take some time to research and purchase the best ATV battery available while your current battery is still working. 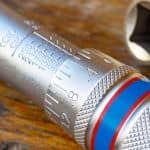 Luckily, here at GarageChief.com we’ve gone through quite a few batteries and will let you know which are the best value and overall top pick. Also, you’ll find a buyer’s guide to help you go through what you should be looking for in your next battery. Let’s start off taking a look at some of the batteries on the market that are designed for various powersports equipment. This will give you our picks for the best battery for an ATV, but we’ll take a look at why we chose each of these. We’ll also mention any drawbacks that have come up in testing, if any were noted. As always let’s start with face-to-face comparison table of our best batteries for ATV picks. And now it’s time to go deeper and look at each of the batteries closer. As you can see our Best Choices are already clear! If you don’t want to go through a lot of reviews, it is simple, buy this battery. The Odyssey PC545 Powersports Battery is made to last, no matter where you take it. It is built to handle any vibrations or shocks. The innovative design means that this battery can offer more power than any other equally sized battery. They offer a version of this battery that comes with a metal jacket for additional protection for your battery. While this battery may only list 150 cold cranking amps, we have found that even on the coldest of mornings it had no problem firing up a SXS. This battery is made for extreme temperatures, so if you live somewhere that hits high highs or low lows, this is the battery to go with. With a service life of up to ten years, sometimes even longer, this battery will last you for years to come, if properly maintained. Odyssey is willing to stand behind this battery with a 2-year limited full replacement warranty. 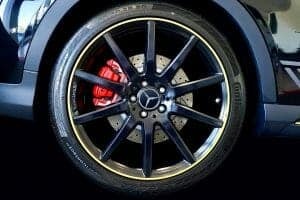 With its vibration resistance and the fact that is a non-spillable battery, you have the option to mount this battery however you feel it would work the best. This is a great battery and it is clearly the best product of all the batteries that we have reviewed. If you agree that this is the best ATV battery, feel free to check it out here. 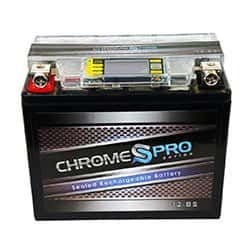 This Chrome Battery YTX12-BS is a great deal for the listed price, as it provides so much value. Delivering 200 Cold Cranking Amps, you should have no problem firing up your system during those winter morning rides. This battery also provides you with a 140 Watts of power to give some juice to both your ATV and a few extras as well. And when looking at power of a battery, some models of the YTX12-BS have a built-in chip and display. This system can show your charge level, letting you easily check that your battery is still holding charge. They also sport an alarm, giving you a warning if you reach a low charge state or if there is some other problem. This battery is solidly built, featuring bridge welding to help absorb any vibrations in the system. And as a sealed battery you have no need to check levels or add in distilled water. This also means that there is no port, so you don’t have to worry about your battery leaking if you get positioned at an odd angle. This is one tough battery and we don’t think you can find a much better one at this good of a price. If this seems like the right battery for you, check it out here. The Battery Tender BTL35A480C is a battery that isn’t worried about size. It comes with a number of foam blocks, so even if the battery itself is a bit small for your given ATV you should be able to get a good fit. This also comes with a quad port design, giving you battery terminals on both ends of the top of this battery. With this feature, you won’t need to worry about your connector cables being long enough to make it to the connections, just use the set that is most convenient. This battery is also extremely light for a powersports type battery. At only 3.75 pounds it is quite easy to move about and will drop at least a few pounds off the operating weight of your ATV/UTV. As a warning though this battery should not be used with any charger that has a peak voltage any higher than 14.8, otherwise damage could ensue. One thing that we have noticed though is that this battery is not a great choice for cold climates, it tends to start things rather slowly. But if that isn’t a concern for you, this is a great overall battery. If you think that is the one to pick, check it out here. 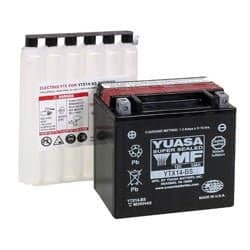 The YUASA YTX14-BS is a sealed battery that doesn’t need to have any liquid added and won’t leak. While it is sold as Maintenance Free, you will still need to take care of it and ensure that it is properly charged (especially during storage). This one delivers 200 cold cranking amps, on those winter mornings when you just have to get things up and going for your ride. It offers 12 amp-hours’ worth of power. This battery comes with a separate container of acid to mix and pour into the battery. While this might sound a little intimidating at first, but you don’t need to worry. The process of mixing and filling this battery is simple and easy. Once the battery is full you can add the sealed cover and not have to worry about anymore checking or measuring, though it will need to be charged now and then. This also means that you know the battery is activating when you add in the mixture, so you don’t have to worry about how long it has been sitting around and if it will properly hold a charge. If this sounds like just the right choice for you, feel free to check it out here. The ThrottleX Batteries ADX14AH BS is a AGM style battery that comes fully charged and ready to use. No need to check levels or top up, no matter how much you use it. This battery sports a heat proof, spill proof lid that means you don’t have to worry about leaks from your battery, even on the most extreme rides. At 11 pounds this battery may be one of the heavier options you can go for, but it offers you 220 cold cranking amps and 12 amp hours’ worth of power. This battery comes with a set of new bolts. While normally you can just use the old bolts, having a new set allows you to swap out if needed, or save them to have a backup. Sometimes if they are not tightened correctly bolts can come loose from the terminal, so having a backup can be a great thing to pull out in a pinch. ThrottleX is so sure that you will enjoy this battery that they offer a 30-day money back guarantee and a 12-month replacement warranty. 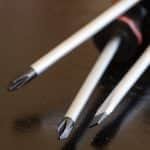 You might find that after using this style of battery, you may not want to go back to the old-style batteries that need to be checked and topped off. If you think that this is the right battery choice for you, feel free to check it out here. While digging through reviews can be great, if you are new, you might be wondering just how do you select the best ATV battery. After all, there is not just one ATV battery for sale that will fit your particular model. To find out the answers we’ll go through our buyer’s guide. When looking at the best battery for an ATV the first thing to consider is the type of battery you require. There are three major Lead-Acid types, the Wet Cell, Absorbable Gas Mat (AGM), and the Gel-Cell. Each of these has strong points and weak points and deserves a closer look before you select one. Most batteries used for ATVs and UTVs tend to be Lead-Acid batteries. This is a battery that has a mixture of acid and lead to store an electrical charge that can be used when needed. Our three cases of battery will all have some type of acid, so use caution when working with them. These batteries can found as either a serviceable or non-serviceable option. They are both filled with a mixture of electrolytes to hold and maintain charge. The non-serviceable or maintenance free option is totally sealed up and when level drops too low your battery will start to lose performance. The serviceable option lets you add in distilled water and check how the mixture is doing. This will mean that you can extend out the life of your battery a bit, but you have to do more maintenance on the battery. This battery type keeps the electrolyte solution close to the metal plates in a battery, which should boost efficiency in both discharging and recharging it. These types of batteries can also hold their charge for a longer period of time, making them a good choice for powersports equipment that you may not get to use daily. A gel-cell is still a lead-acid type battery but instead of having a liquid like a wet cell the electrolyte solution is suspended in a gel. This leads to many these types of battery having many similar characteristics to the AGM type of battery. While these types of batteries may provide a better life in hot environments, they require a special type of charger. If these batteries are over-charged or used with an incorrect charger their lifespan will be cut. While looking over battery listings you will see that these types of batteries come with a set of dimensions. If you use an online tool to select a battery for your particular ATV you should be alright, but if you are selecting a high-quality battery you may need to have some knowledge on your side. Your ATV or UTV’s owner’s manual should list out the correct size of battery you need. Failing that you can break out a tape measure to gather the dimensions from battery you have hooked up. If you select a battery that is too small you won’t be able secure it properly. Too large and it just won’t fit in. Either way you don’t want a loose battery bouncing about. This one is a simple one to get a hold on, though there are some areas that people might miss. If you just like taking your equipment out for a fun ride you only need to be concerned with the amount of power your ride needs. However, some people use their ATV to help them out on the farm. In this type of application, you will need to power your ride and any extras that you might feel the need to run. For this you should take the power needed for the ATV and add on the power level of all the other items you think you may run at the same time. It is best to size your battery purchase for the highest power level you think you’ll need. You don’t want to be out in the field hoping you have enough power to attach that one more thing. While most batteries that you come across for this type of application will be 12 Volts, you will want to look at some of the other numbers. Cold Cranking Amps (CCA) gives you an idea of how much power you can get to start the system up on a frigid morning. SAE J537 specifies that a battery with a CCA reading of 500A can deliver 500A at -18ºC (0ºF) for 30 seconds without dropping below 7.2 volts. 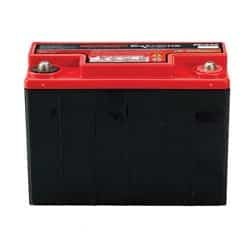 There are some other things to consider when looking into a best battery for ATV, UTV or other Powersports vehicle. In some cases a set of best jumper cables may get you out of trouble when a battery suddenly goes dead. While modern ATV batteries, when properly mounted in your machine, should not have any problem with the heat produced from driving you will want to consider the vibrations for an important point. 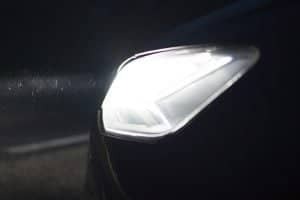 You will need to ensure that you the proper connectors for your battery and that they are tightened down enough. Some batteries only offer a slide on prong while others allow provide a terminal with a bolt to screw down, tightening the connector in place. The cord could become disconnected if it is not properly attached or after a particularly rough ride. Another thing to consider is the maintenance of your battery. While many modern batteries are sold as “maintenance free”, this only means that you don’t need to worry about topping off their internal fluid levels. You should make sure that your battery is properly charged. For the initial charging, you will want to use a trickle charger, one that is designed for ATV batteries (find out more about all types of battery chargers). 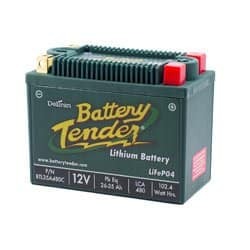 TIP: This Battery Tender 021-0123 Charger will charge and maintain your battery so that it is ready to go when you are! It’s lightweight, fully automatic and easy to use. . This process will probably take from 8 to 10 hours. Then be sure that if you won’t be riding your quad for a while make sure you park it fully charged or attach a charger. If you aren’t using your ride, you should ensure the battery is charged every 2 months. Storing a discharged battery can damage it. 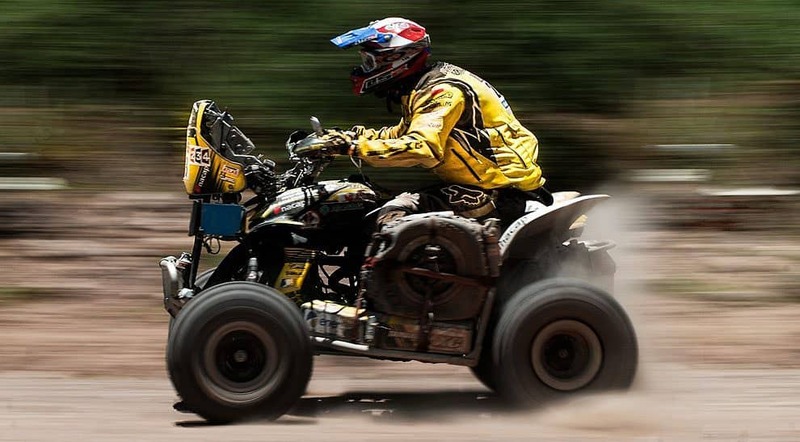 If you are selecting a best ATV battery, a safe choice is to go with one of the top brands. In our testing, we’ve found that these were the best choices. Odyssey is part of EnerSys Energy Products. They have been making batteries for over 100 years. This gives them lots of experience to fall back on when making the high-class batteries that you count on for your ATV and UTVs. To ensure that all of their batteries meet the standards that they’ve set, all Odyssey batteries are manufactured in one of two plants. One based in the United States and the other based in Wales. These batteries combine both deep cycle performance as well as extreme cranking power. ThrottleX batteries are made in Michigan and the company is family owned. This father and son team has over 50 years of experience combined between the two of them. in producing batteries that can meet the highest standards. 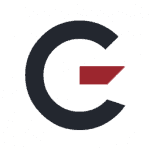 Their goal is to provide not only a top rate battery but offer it at a competitive price. They have built a reputation for honesty and customer service that goes above and beyond. They try to make a product that lets you buy it, install it and then ride on with confidence. Back in 1977 YUASA Battery Japan formed a joint venture with an American based company, General Battery Corporation. This new company got its first battery out in 1979 and has kept going strong since then. The majority of their larger batteries are made in their Pennsylvania plant, the others are distributed among plants all across the globe. They have a market of replacement batteries, but are also selected by many companies to provide the original battery that comes with power equipment. They can make the claim that they supply more OEM batteries then all of their competitors, and they mean them all combined. This company started back in 1965, formed by a family that still owns and runs the company today. This company stands out from other battery manufacturers, in that they make both batteries and chargers. In fact, as you do any amount of research on batteries you will find people mention their chargers. They strive to stay state of the art in the designs of all of their products. 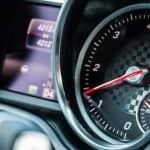 They also focus on customer service, knowing that performance isn’t only a business buzz word, but a way of life for both their company and their customers. Chrome Battery’s CEO Dale Petruzzi started in the battery business 25 years ago. At that time, he realized that many of the batteries that were being sold came from plants outside the US and were of a low quality. He decided that he would start his own company to make sure that batteries were not only made inside the USA, but also would be made to a high standard. However, he was not out to only make money, he started his business with the idea that these batteries should be available to his customers at an affordable price. If you have an ATV you will no doubt at some point looking at an ATV battery for sale. There is an awful lot of information available. Some of it good, some of it rubbish. We hope that you’ve found everything here has been helpful in your search for the best ATV battery. This can be a long search, but any of the ones that we’ve reviewed for you would make an excellent choice. We’ve also shown you what to look for in a battery. And remember, it is always a wise idea to choose the highest quality battery that you can afford, as this will normally give you the longest lifespan possible. We’d love to know which one you’ve selected, tell us in the comments below. 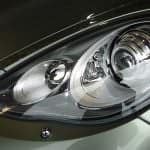 Best Windshield Wiper Blades: These Are Truly The Top Ones Right Now..